“It’s gonna be slow,” my friend warned. “I want to gather some things along the way to make a mandala.” She mentioned something about needing to “right the world.” Maybe she said “for healing” and “to calm spirits.” It didn’t matter what she said. It resonated. And I was desperate to escape. 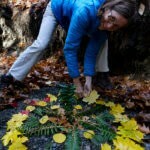 In the woods, on the way to locating the creek that would be blessed with our “round symbol representing the universe in a search for completeness and self-unity,” my friend and I collected leaves, ferns, twigs, small patches of moss, and a single red berry. “We need seeds for the mandala,” she said, something about “planting change and growth.” My previous mandala-making was mostly out of the peas and potatoes on my dinner-plate. So I kept quiet and my friend showed me how to string red and yellow leaves together, threading their stems through their papery skins. She arranged the elements while I photographed leaf veins that resembled tiny trees. She planted a feather in the middle of the masterpiece when it became apparent that I’d stepped on the berry. Finally my friend was satisfied. She’d done her part to foster peace in the world. So we left the woods and went to my house where she screwed the shelf back into the wall and rescued the dieffenbachia plant. Maybe she said a prayer over the driveway’s leaky pipes and contaminated water too. I don’t know. But things felt a bit lighter, restored to order. Do you have any rituals or remedies for coping with things falling apart and failing? For things changing? 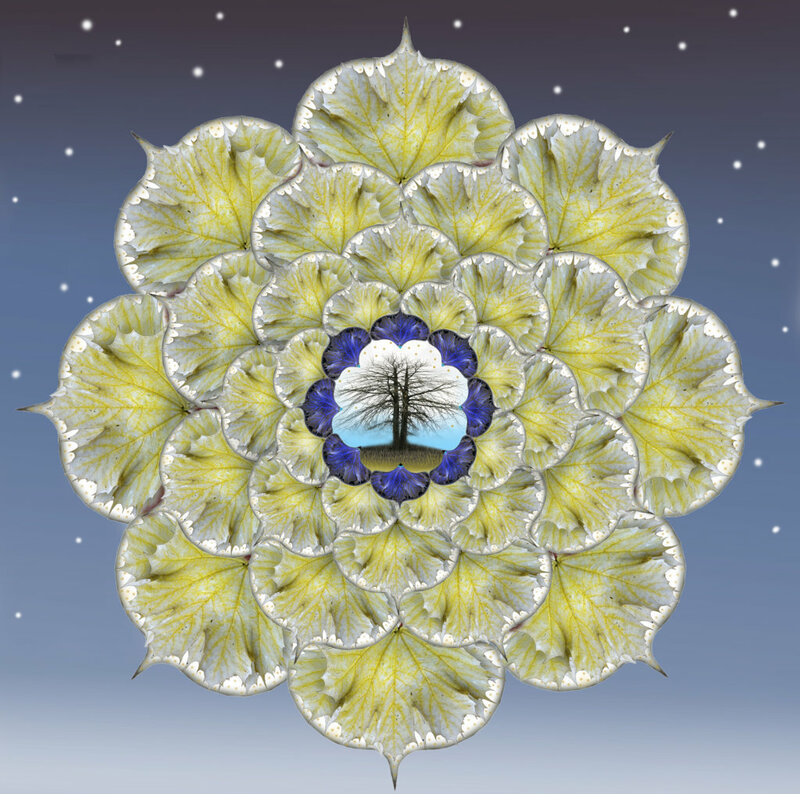 This entry was posted in 2016 and tagged creating rituals, depression, election results, everything falling apart, making mandalas, Making Mandalas for Healing, mandalas, numb to the world, stages of grief, walking in woods on 2016/11/14 by Robin Botie. A big yes to mandalas. Mandalas always help me. Did you take photos of what was created in the woods? I gather things from the forest to make altars (sometimes but not always mandalas) inside or outside. I also use stones, acorns, and other things I find in sand tray mandalas. The Buddhist temple in town has a beautiful sand mandala–or they did last week. It’s their tradition to make these intricate designs and then sweep them away. Most religious traditions have mandalas for good reason. They quiet and center us. The playful aspect feels important to me. What kid doesn’t love making a mandala in the woods? Yeah, Elaine. I get it about the quieting and centering. I mean, I get entirely lost making mandalas. I gather photos of trees, clouds, …whatever I happen across in the woods, in a yarn shop, wherever I am with my camera. I plant the things in layers in Photoshop; each tiny individual items has its own layer. And I keep copying the item, putting it in a new layer, spinning it or tweaking it sometimes to fit. My photoshopped mandalas end up with hundreds of layers. Sometimes I link a bunch of the layers together to make working more manageable. It hurts my head to think of erasing one of my mandalas like they do at the Buddhist temple in town. Each mandala represents hours of my life. Each one represents a bundle of time thinking about whatever it was that inspired me to make a mandala in the first place. It would be like sweeping away love. Thanks for explaining the delicate intricacy of your creative process. I think the Tibetan Buddhists are sweeping away our idea that anything is permanent. I’m positive we never need to sweep away our love. Definitely. Positively. Don’t ever sweep away our love. I think the Tibetan Buddhists would agree with that, Elaine. Cheers! This too shall pass. That’s all I can think of to assuage the doomsday feeling I get when everything seems so negative. I call the electrician to fix what’s broke; I call the plumber to restore the life of the faulty system; I call the doctor to resume the expired therapy that allows me to function physically; I do what I can to take cared of the pesky interruptions to the everyday stuff that makes my life manageable. I try to remember to accept the things I cannot change and to hope for better times. We’re in for a very bumpy ride — the next four years. The best we can do is hang in there with a fighting spirit and wait for the next time we can change the wrongs back to what we thought was right for the majority of the people of this world. Well, actually, calling the plumber and doctors could probably work at least as well as constructing a mandala for each of my miseries. I’m finding it cheaper and more satisfying to sit at the computer and build mandalas however. Don’t worry though. I don’t believe I can keep this up for four years. It sure does help me to “accept the things I cannot change and hope for better times.” And the “doomsday feeling” definitely subsides as I immerse myself into the multiple layers of Photoshop. There’s nothing quite like being pulled back out of the depths of Photoshopping to a phone call, “Hey, where are you? You were supposed to be here for your appointment a half hour ago.” All the “pesky interruptions” disappear real fast then as I race down the hill to reset myself and make it to whatever I missed. “Bumpy ride.” Every time I make a mandala in Photoshop. Cheers, Mom.